Food trucks are ever so popular on a beautiful day in Wisconsin. So if you’re strolling through Madison, Milwaukee or other areas of the state looking for a quick bite, these 10 delectable food trucks will surely give you what you’re looking for. From the best cheese curds around to legendary gyros, Wisconsin can satisfy a range of cravings. Check out some of the best food joints on wheels in the state. Get Them While They’re Hot Tamales is a mobile food cart and catering business. They offer great on the go traditional Mexican dishes within the Milwaukee area. Check out their interactive Facebook page for location details and prices. In true Wisconsin fashion, we present Curd Girl. Wisconsin is famous for cheese and tasty cheese curds. Chosen as Best of 2015 in Madison Magazine as well as being award many other accolades since their start. Find them at the Dane County Farmers Market, and other preplanned locations on their Facebook page. The Gouda Girls offer a full service of Wisconsin dairy and food products to its Milwaukee residents. Try simple dishes like homemade bread and topped with thick Wisconsin cheese, or become a cheese wiz by indulging in their grilled mac and cheese dish. Coined as Milwaukee’s first and only sushi truck—it is just that. Find them at events and outside of your local watering hole. Thick sushi burritos and classic roles are available for purchase and are sure to hit any sushi craving that you’ve got and for a great price. The Freeman Brother BBQ has a food truck, does catering, and participates in competitions. Their award-winning BBQ trucks tours around Dane County, with extra napkins too. Check out all their award online and find which stores near you carry their excellent sauces. Enjoy traditionally Mediterranean dishes right in the heart of Madison. Since 2011 they have been whipping up their famous falafel made fresh every day. Find them daily in downtown Madison near the University of Wisconsin during the lunch hours and at your favorite events throughout the summer. Serving traditional American hot dogs, Looy’s Dog is located in Appleton. They also are known for their famous hand popped kettle corn. Find them in front of the Durty Leprechaun on College Avenue. Check out the Fox Valleys most favored food cart! 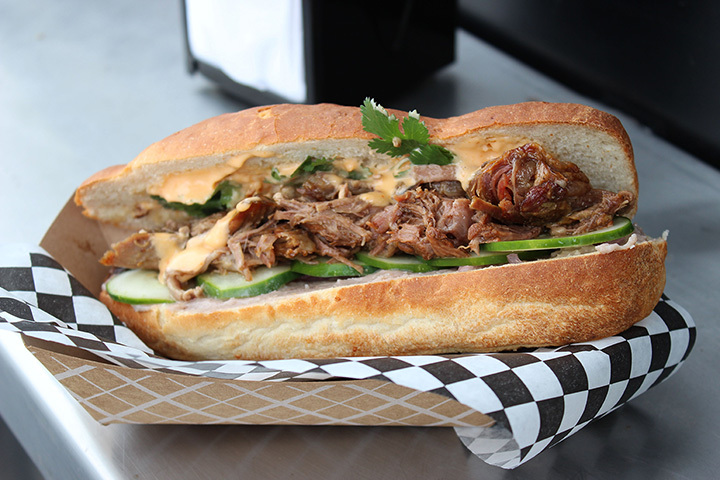 Fleck’s Curbside Grill started in 2012 and brings its customers tasty sandwiches. From fish, to burgers, to chicken and steak favorites there is a wide variety to choose from for being a food cart. Sides include fries, cheese fries, chili cheese fries, nuggets, and mozzarella sticks, an much more. Curb your appetite at Fleck’s Curbside Grill. Pita Hut is home to Big Ben’s Famous Gyros in Ashland, Wisconsin. Not only can you find gyros, visitors can select from food items like burgers and cheese curds. You can find them touring the Ashland area near Lake Superior. How can we not add an ice cream truck to our top 10 list and why doesn’t every town have one?! Bee’s Ice Cream has ice cream treats, snow cones, cotton candy, and our beloved classic ice cream flavors. They have been travel the streets of New Richmond for the past four years. View more Wisconsin Food Truck Festivals and Events.